Welcome to luxury cabin living at My Ok-La-Home. My Ok-La-Home is comfortably furnished and offers all the amenities of home. 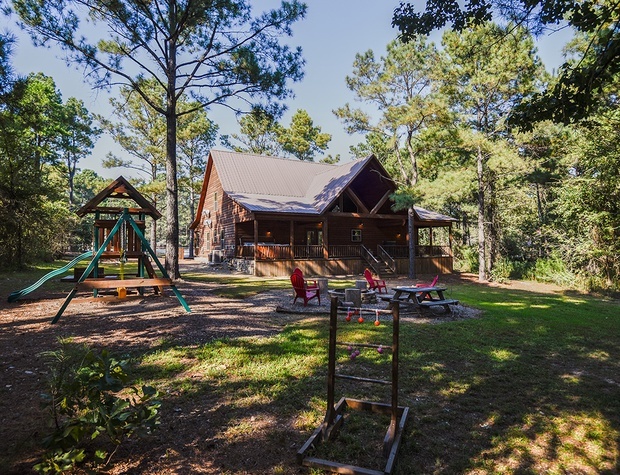 Situated on a 1.38 acre wooded lot, this unique cabin is almost 2,800 square feet of interior living space and offers plenty of room for you and your family to spread out. My Ok-La-Home features 4 bedrooms, 3 bathrooms, media room which doubles as a 5th bedroom or second living area, and a large game room with pool table. Antiques, southwestern decor, log furnishings, and original artworks come together in this beautifully decorated home. 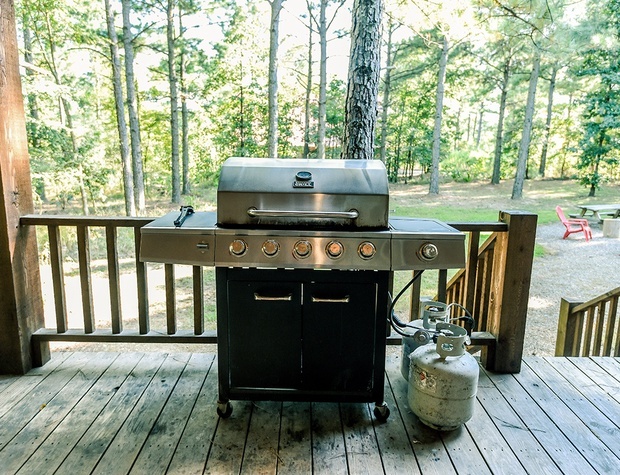 Outdoor amenities include a large, eight person hot tub, gas grill, outdoor dining area, outdoor seating, fire pit, and an occasional deer passing through the back yard. 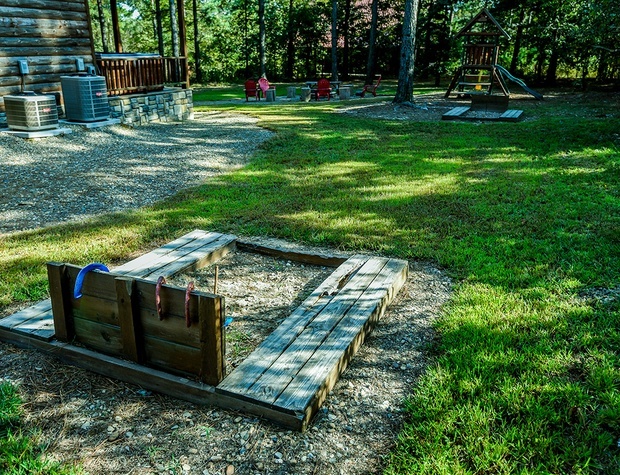 Other outdoor activities include a horseshoe pit, children’s play set, and ladder golf. The state-of-the art kitchen is amply stocked to allow you to serve your family a gourmet meal – Oklahoma cookbooks are available to provide local inspiration. The home features six flat screen TVs, two DVD players, and Dish Satellite TV. Large windows on both the north and south exposures provide beautiful views of the outdoors all year. Games, movies, books and binoculars are available to keep guests entertained. Kids and grown-ups alike will want to spend the night in the upstairs wall bed – a creative bed, literally in the wall. It’s a great place to share ghost stories or snuggle up on a cold winter’s night and watch a movie. Also in the upstairs media room are a mini-microwave for popping movie popcorn and a small refrigerator to store your sodas. Each bedroom features a comfortable bed, flat screen television, an alarm clock and MP3 player/charger, an extra blanket, artwork and upscale decor. 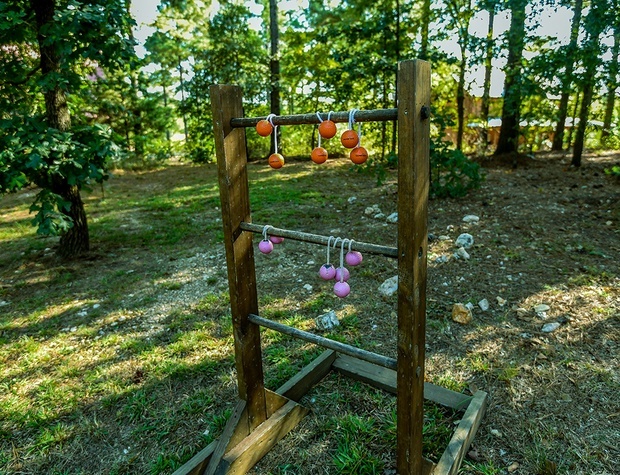 My Ok-La-Home is conveniently located off Hwy 259 by The Blue Rooster and across the street from Girls Gone Wine and the entrance to Beaver’s Bend State Park. 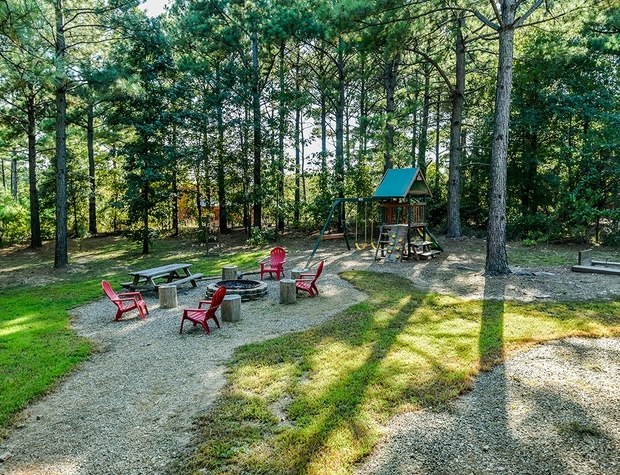 It boasts a large, wooded lot with plenty of room for children to play. No cliffs to navigate or steep hills to climb. Master suite with king featuring an iComfort mattress and box springs with private bath including a custom walk-in shower, oversized garden tub, his and her vanities, and large walk-in closet, 32″ flat screen TV, and alarm clock with multiple MP3 charging stations (downstairs). 2 Queen Bedrooms that share a hallway bath with tub/shower combo, large closets, each with a flat screen TV (one 32″ with a DVD player and one 22″), and each with a MP3 player/charger (downstairs). King bedroom featuring an iSeries mattress and box springs with connecting full bath featuring a tub/shower combo and twin pull-out sleeper sofa, 32″ flat screen TV and alarm clock with multiple MP3 charging stations (upstairs). Queen bed in the media room, 47″ flat screen TV, DVD player, alarm clock and MP3 player/charger, mini-microwave, and small refrigerator (upstairs). There is also a Queen Air Bed for additional sleeping. For guests looking for an upscale, true luxury experience, this home is it. Information about the area as well as information about the home are provided for the guests’ convenience. So, go ahead… make My Ok-La-Home, YOUR-Ok-La-Home. Maximum Total Occupancy: 15 guests with a twin oversize chair sleeper sofa and additional bedding provided by guests (total occupancy includes adults, children & infants). Exceeding maximum total occupancy, regardless of the guest’s age, will result in additional charges and/or possible cancellation. NO PETS ALLOWED. Due to owner’s and other guests’ allergies, we ask all guests to enjoy a dander-free vacation. If you bring a pet you will be asked to leave and no refund issued.